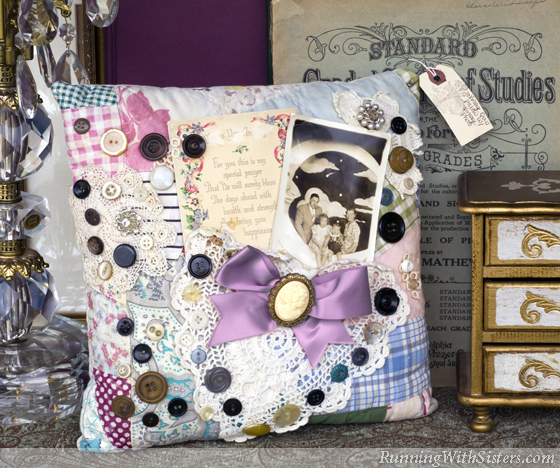 We’ve always been drawn to vintage lace and notions, but after finding a collaged memory pillow at a cottage-style pop-up shop, we really fell in love with them! This sweet heirloom had a family portrait tucked into a doily pocket outlined with buttons. It was so inspiring, we brought a picture of it with us to the flea market so we could make memory pillows of our own! We already had two quilted pillows from our grandmother, so this trip was all about the adornments. 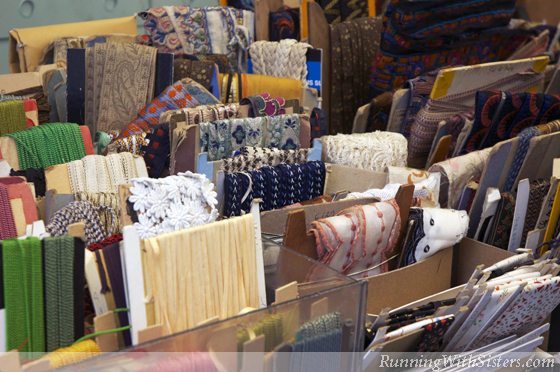 A booth just past the ticket line had bolts of fabric, cards of trims, and tables of sewing doo-dads. 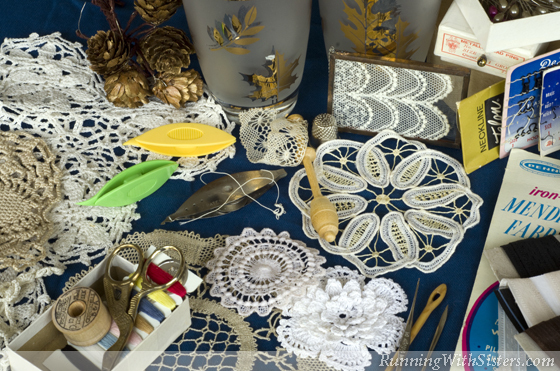 Kitty picked out a tatting shuttle and some ribbon, while Jennifer dived into a tray of vintage buttons. Each button was sewn onto a square of sheet music with labels on the back indicating price and material. We skipped the $35 celluloid ones and chose perfectly pretty steel-cut and iridescent glass buttons in the $3 to $4 range. Kitty worked her flea market magic, and we got the whole lot for $20. Off to a great start! A little later, we shopped a stall filled with racks of lacy tablecloths. We dug into an inviting basket of linens, setting aside two hankies with tatted edges and a crocheted flower. 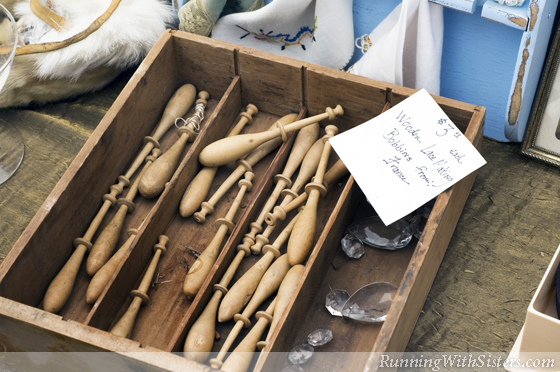 Jennifer asked about a crate of wooden bobbins marked only $3 apiece. 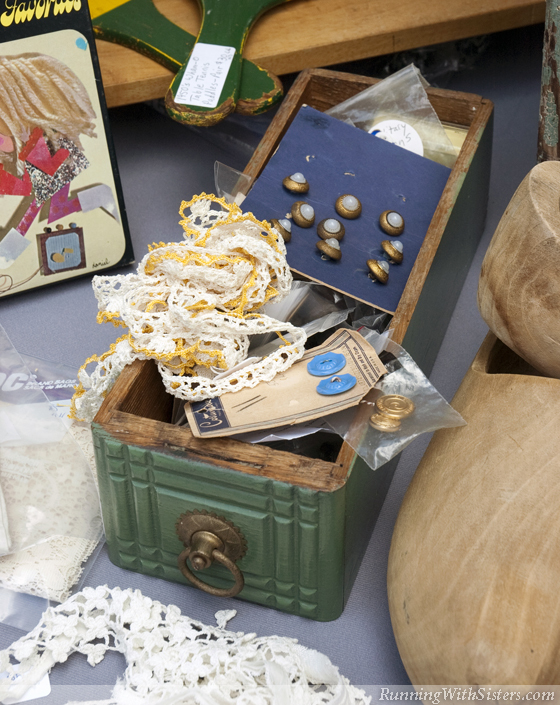 The dealer explained that bobbin lace required so many bobbins that they are hardly rare. It helped to see a picture of the process–dozens of bobbins and threads being crisscrossed over pins to create a pattern. She told us it could take over an hour to do an inch. No wonder it’s so lovely! 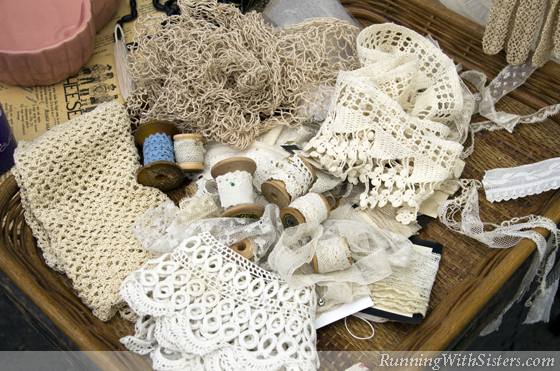 Kitty asked how to know if lace is handmade, and the gal said it can be hard to tell, but to look closely at the lace. Most handcrafted knots will not be as uniform as machine-made. Then she said to make sure it feels soft and has natural fibers. “The most important thing, though, is to pick pieces you like!” With that, Jennifer got three bobbin-lace doilies and a tatted collar. And Kitty selected a “Battenburg doily with a Solomon’s knot.” It sounded spendy, but it was a steal for only $4! Shuttle tatted lace is not only beautiful, the way it’s made is fascinating. The thread is wrapped around the fingers on one hand while the marquis-shaped shuttle is passed over, under, and through to tie knots. The knots are then pulled together to form rings, picots, and chains. It’s intricate work, but from what we hear, it’s addicting as a craft. And a collection! Antique shuttles from the 1700s and 1800s made of gold, silver, or mother of pearl can cost hundreds of dollars. But you can get vintage ones in Bakelite or metal for $10 to $20, often with lace projects still attached! You can even buy new tatting shuttles in bright-colored plastic, two for $5. Don’t scoff––buy them now and they’ll be collector’s items in a few decades!